It is one of the most beautiful days of the year, 16th of June. It is perfect for many fabulous and glamorous events, such as a birthday—you can't choose your birth date, and I am so lucky that it IS my birth date, a wedding (Wedding in June at The Plaza or Ritz? ), or, a horse racing. Oh I love horse racing. Horse is such a mysterious creature that is so beautiful, so strong, yet so fragile. It appears in numerous fairy tales as symbol of strength and royalty. They can recognize you if you are anxious or scared, are very difficult to control, but very loyal once you get it from them. Horse race is a status symbol of a complicate ability with determined talent and dedication, and one's prosperity (as well as statistic expertise with sharp-eyed observation for tipsters and punters). And this year, a bright sunny day of June 16th, one of the best horse racings, a french horse racing, no less, was happening. The Prix de Diane Longines. Like any other horse racings, it was full of wealthy, wonderful and stylish attendees, wearing the best in their wardrobes, and oh fabulous hats everywhere. It's such a perfect occasion to look exquisite head to toe. And yet, unlike other horse race, it was held by the racecourse of Chantilly, located in the foot of the sumptuous Chantilly château, welcoming more than 47,000 people. Organized by France Galop, a governing body of flat and steeplechase horse racing in France, this event was not only about sport and sweat. Well, it is, but France Galop is also well known for their fantastic concept in hosting an event. Socialites, politicians, businessmen, actresses and actors, as well as milliners (who might have met their creations worn by prominent guests and celebrities all around) were having a sweet sumptuous summer party. With gentlemen enjoying the adrenaline rush along with the horse riders on the track, the ladies flaunt their beauty and sartorial taste not to be outdone by others, since the competition is not just on the track. The most elegant lady with the most impeccable taste (and most enchanting hat) will be awarded the Prix de l’Élégance Mademoiselle Diane by Longines. 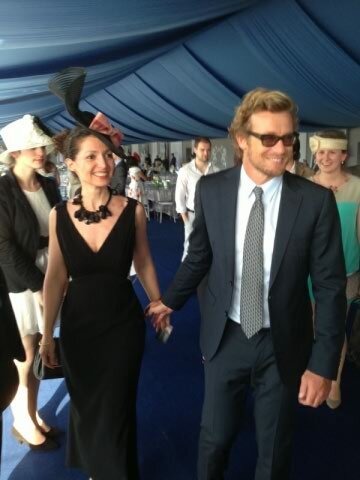 This year, selected among 200 candidates, Marie-Camille Raynaud was elected as the Mademoiselle Diane par Longines after a fashion show along the avenue de Diane in the centre of the racecourse, had the opportunity to meet Longines Ambassador, the hottie brilliant actor with charming look Simon Baker (people referred him as the leading actor in the Mentalist, but I strongly recalled him on Devil Wears Prada's Christian Thompson) and bestowed many prizes, including a Longines watch—steel and rose gold model set with diamonds from the Conquest Classic collection. Lucky lady. To read more about this event, visit France Galop's site, Longines, and Prix de Diane Longines. See you next year!